The Faculty of Arts is one of the founding faculties of the second Czech university. The first president of the Czechoslovak Republic significantly contributed to the university’s foundation, and it is named after him: Masaryk University. Beginning in the 1880s, Tomáš Garrigue Masaryk emphasized the need for the broadest possible competition in scientific life and drew attention to the fact that the only Czech university at that time urgently needed a competitor for its development in the national context. The endeavour to establish a second Czech university was one of his political priorities for many years. The Faculty of Arts, as a part of Masaryk University, endowed with the task of becoming the next focus of national education and enlightenment, provided the words used in the memorial foundation charter of 1919, to ‘live, grow strong, and flourish in noble emulation of its older sister in Prague’. The Faculty was opened to students two years after the founding of the university in 1921. There were 128 students enrolled in the first year, and they were able to choose from among several courses. There were mainly traditional disciplines, such as history, philosophy, and classical philology, as well as Slavic, Germanic and Romance philology. However, the students also signed up for the courses which, at that time, represented new directions of research: sociology, psychology, art history, musicology, and pedagogy. This linking of tradition and innovation, not only in the structure of the courses, continues at the Faculty today. Today’s students can choose from dozens of Bachelor’s and Master’s degree study programmes. Ever since the 1920s, the Faculty of Arts, as well as the entire university, has taken a strong and unmistakable place in the scientific, cultural, and social life of the country. Arne Novák (1880–1939), a professor of Czech literature, who was the dean of the Faculty 1924–1925 and a rector of Masaryk University 1938–1939, was the embodiment of the modern and confident aims of the Faculty. Julius Heidenreich said about him: ‘In him and through him Brno was becoming an independent literary and artistic focus and a confident centre that would assess critically all the spiritual development in our country.’ As the dean in 1925, he actively supported granting the first honorary doctorate to the composer Leoš Janáček, whom he greatly respected. Leoš Janáček had a very positive relationship with the Faculty of Arts as well as the whole Masaryk University. He showed it in his compositions (Sonata 1. 10. 1905, dedicated to the struggle for a Czech university in Brno, and a cantata for the ceremonial laying of the foundation stone for the Faculty of Law) and in a generous legacy to the benefit of the Faculty of Arts. In the 1930s, Masaryk University became the copyright holder of Janáček’s music and literary production. The university has been the caretaker of Janáček’s artistic legacy ever since. Between the world wars, the Faculty hosted a number of prominent personalities who contributed to the development of the disciplines and who also achieved world fame. These include Roman Jakobson (1888–1969), a professor of Slavic philology and a world-class linguist, who was habilitated in Brno in the field of Russian philology and was appointed a distinguished professor in 1937. During his stay at Masaryk University, he led lectures in Russian philology and morphology and courses on Russian verse, Pushkin’s epic, and the history of Czech-Russian cultural relations. The university was in great danger at the end of 1930s. On November 17, 1939, it was closed down by Nazi occupiers, as were the other Czech universities. According to the internal instructions of the Reichsprotektor, Brno University was to be regarded as non-existent, and these instructions were carried out. The damage suffered by the Faculty during the war years was immeasurable and irreparable. Far more burdensome than the material damage was the loss of professors and other university employees, caused by direct Nazi persecution. The Faculty can be proud of the fact that its teachers and students included people who resisted the occupiers and were willing to lay down their lives for the values of democracy and human rights. After the end of World War II, the Faculty attempted to return to its status in the pre-war period. Due to the war losses of distinctive academic personalities and to the transformation of the political establishment after 1948, this was not an easy task. At the beginning of 1960s, it was no longer Masaryk University, but the University of Jan Evangelista Purkyně in Brno. This change in the university name was meant to symbolize turning away from the values and democratic ethos of the independent Czechoslovak state. Under the Communist regime, only such study fields that would not endanger the party’s ideology and that would help to create the illusion that it was possible to achieve excellent research results in the context of ‘real socialism’ were able to develop. Such fields included, for example, archaeology. After the second half of the 1960s, happier times came into the history of the university, when the easing of the political situation created more favourable conditions for research and teaching. Jan Patočka, who lectured at the Department of Philosophy in 1966-1968, maintained contact with the Faculty. At that time, his appointment as a professor was proposed, and his correspondence shows that Patočka was considering moving to Brno. This important philosopher and later co-founder of Charter 77 taught at the Faculty, led lectures for philosophical unity, and published articles in the Faculty’s anthology which he credited to his Brno friend, Professor Václav Richter. It was Friday evening, November 17. In Prague, the Communist regime took action against the student demonstration. At the Faculty of Arts in Brno, students went on strike on Monday morning. At 1 p.m. there was already a gathering in the Faculty courtyard, with great participation on the part of the academic community. The sound was provided from the library building, the speakers spoke from the window of the former library storage room (an extension to the courtyard part of the entrance building). Here, the members of the strike committee were announced: five students – Igor Fic, Jaroslav Hubatý, Jan Sládek, Roman Švanda, and Jiří Voráč; teachers also took part –Zdenka Rusínová and Dušan Šlosar from the Department of Czech Language, Jana Jelínková from the Department of Russian Studies, and Miroslav Pospíšil from the Department of English Studies. 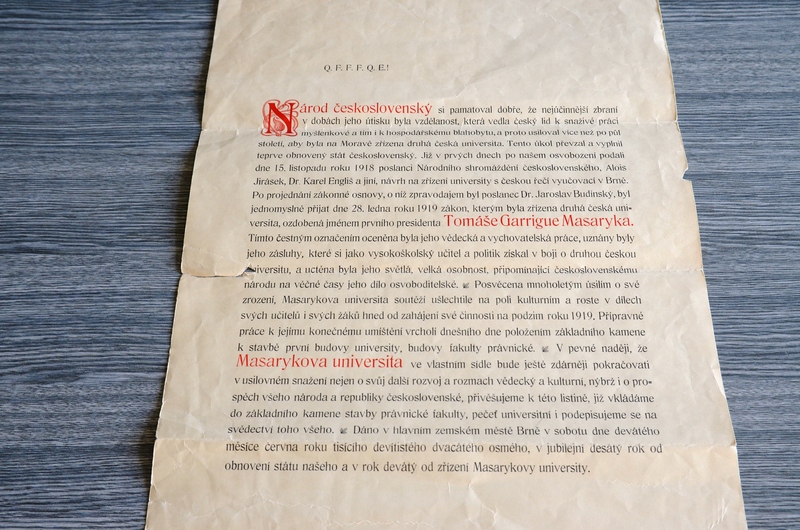 In 1990, the University returned to the name of T. G. Masaryk. This return to the original name was a symbolic connection to the roots of the University of the First Republic, and to the return of those teachers who had not been allowed to work at the Faculty in the previous years. It was also a return to teaching of those who had been allowed only professional activities. It was a restoration of academic freedom which went hand in hand with the development of education and scientific research in an international context. The Faculty of Arts is now a dynamic university institution offering education in dozens of fields of humanities and social sciences. In terms of the number of enrolled students, it is the largest faculty of Masaryk University. According to the statistics of the Ministry of Education, Youth and Sports, it is the largest faculty of arts in the Czech Republic. The Faculty has high quality research teams that participate in prestigious grant calls and are involved in an extensive network of partner institutions in the Czech Republic and abroad. The spatial and financial conditions for the development of research in science and humanities have also significantly improved. Since 1921, when the teaching began in a former boys’ orphanage (now building A on Arna Nováka), the metaphorical ‘heart’ of the Faculty - a centre consisting of two older buildings and another modern award-winning one, which is a library, originated in these places. Some Faculty departments moved into their own buildings in the immediate vicinity of the city centre.